Another top round steak!!! How many of these things do we have left in the freezer!!! We will never be rid of them it seems... 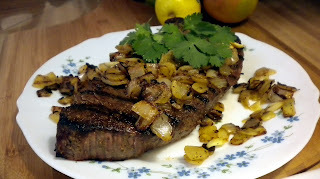 I tossed this one in some citrus juice with a little tequila to loosen up the meat. Though far from being my favorite cut of meat, it was quite good used in burritos and own its own. Combine all ingredients and set to side until ready to use. Meat hammer both sides of steak until loosened. Combine the marinade and meat in a resealable plastic bag and refrigerate for 6 to 24 hours, flipping the bag occasionally. One hour before grilling; remove top round steaks from refrigerator and marinade and massage the rub into the meat. Sit covered on the counter for 1 hour to bring to room temperature. Place steak directly over flame and cook for 2-3 minutes. 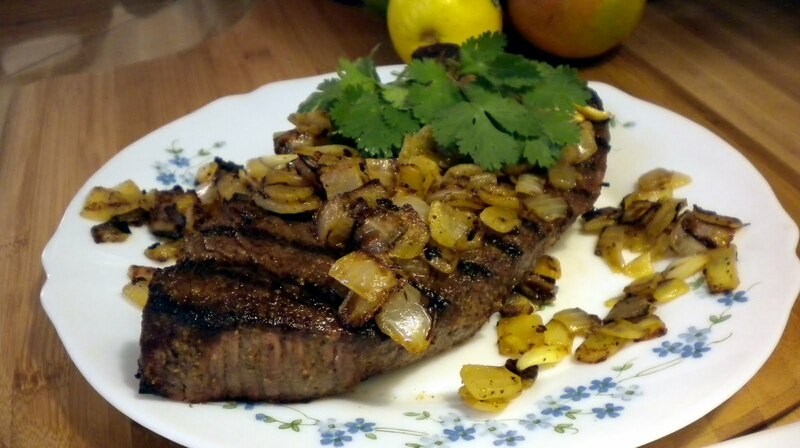 Flip steak and cook for 2-4 minutes. Remove from heat and cover with foil letting sit for 5-10 minutes before slicing thinly across the grain and serving hot with onions over the top.